New to St. Margaret Mary Parish? St. Margaret Mary Catholic Church and Parish is a friendly, active and growing faith community in the Diocese of Rockford. There are many ways to get involved at St. Margaret Mary. We invite you to share our tradition of serving others; our parish, our community and the world around us, by joining one of our many ministries. Joining will have you meet new people and make new friends and serve people in the name of God. Being part of a parish means that we help each other and together we help others in the name of Christ. Being part of a parish means that we help each other and together we help others in the name of Christ. That takes your Time and your Talent (both of which are very valuable). We know you will be blessed, if you give your Time, Talent and Treasure. If you are new to our Parish or you have just moved to the area– we welcome you! Please contact our Parish Office at 847-658-7625 during normal business hours or via email. Additional information can also be found in our Parish Bulletin or inside our web site. To register as a parishioner, please contact our Parish Office at 847-658-7625 during normal business ours and we can register you right over the phone. We look forward to hearing from you and to joining our faith community. PARISH OFFICE HOURS: Monday – Friday 9:00 AM – 5:00 PM (Fridays 9:00 AM to Noon in the Summer). Saturday: 9:00 AM to 1:00 PM. Sunday: 9:00 AM – 1:00 PM. Being a member our Parish means celebrating and making a commitment to Jesus Christ. If you are new to the Algonquin/Lake in the Hills, or if you have not yet become a member of St. Margaret Mary, we encourage you to consider joining our community in worship and ministry. Call the Parish Office at 847-658-7625 for more information. Thank you and God Bless you and your family. 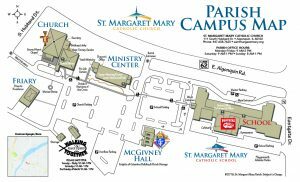 Our Parish Campus consists of many different buildings and facilities designed to serve the needs of the faithful at St. Margaret Mary. 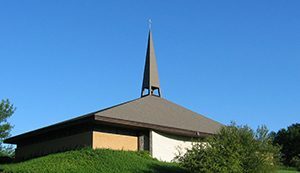 Our Church and Parish Offices (which include our Business and Liturgical Offices) run from the west along Algonquin Rd. to our Ministry Center, which includes McDonnell Hall, and then our Parish School bounded by Eastgate Dr. on the east side of our campus. In between we have our Friary (Priest’s Residence), our Walking Together Resale Shop, McGivney Hall (Knights of Columbus Building and Parish Storage). There is also a playground and athletic fields south of the school. 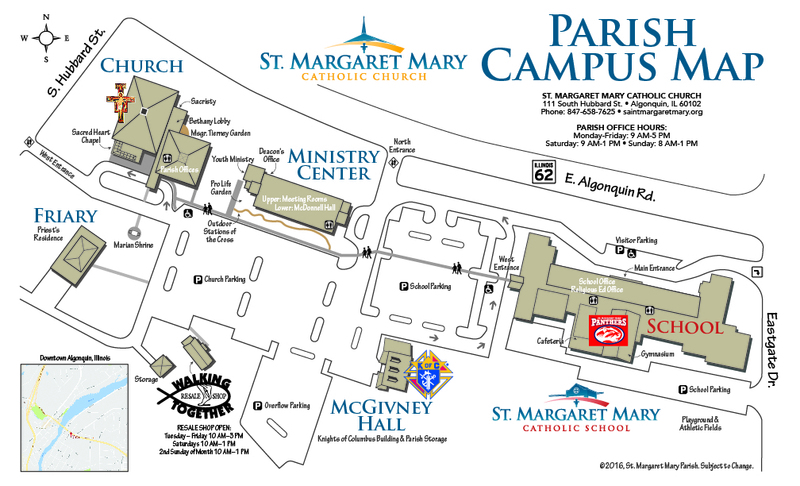 Please click below for a PDF of our full Parish Campus Map or click the image at right for a larger view. 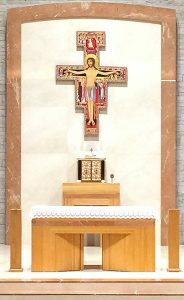 St. Margaret Mary is blessed to have a replica of the famed Cross of San Damiano hanging within our sanctuary (pictured at right). Have you every wondered what all of the images mean and the significance of the cross itself? The original cross was fashioned around the year 1100 and hangs in Santa Chiara Church in Assisi. When in 1257, the Poor Clares moved to Sanata Chiara, they took the original San Damiano Cross with them and still guard it with great reverence . Please click below for a PDF explaining the Cross of San Damiano.